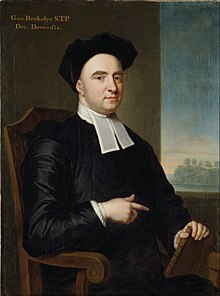 George Berkeley (12 March 1685 – 14 January 1753), or Bishop Berkeley, was an Irish bishop and philosopher. Berkeley was one of the three 'British Empiricists', philosophers around the late 1600s and 1700s who believed in 'empiricism', the philosophy that everything we learn comes through our senses. The other British Empiricists included the Englishman John Locke and Scotsman David Hume. His philosophy was called "immaterialism", or "subjective idealism". His idealism said that all our ideas came through sensations, but our senses didn't tell us anything about the world. He said that Locke's belief in matter was wrong. He said that even though we can see, hear, taste, touch and smell, there was no way of knowing that our senses were reacting to matter, because to find out how accurate our senses were, we would need to study the very thing we use to study. Instead, he said that our experiences are caused by God, a being that is also a mind, like us, and powerful enough to create all our ideas and senses. Berkeley was born at his family home, Dysart Castle, near Thomastown, County Kilkenny, Ireland. He was educated at Kilkenny College and attended Trinity College, Dublin, completing a Master's degree in 1707. ↑ He was Bishop of Cloyne. This page was last changed on 11 August 2018, at 20:54.